One of the best feelings is a hot shower on a cold day when you’ve become chilled. Period. End of story. It is awesome! However, an even better option would be to stay warm in the first place. To this end, Klim has been thinking proactively. First to go in the cold are your extremities. Hands and feet. For the latter, the new Klim Hibernate Socks are here to alleviate some of the metatarsal maleficence that can result if improperly clothed. 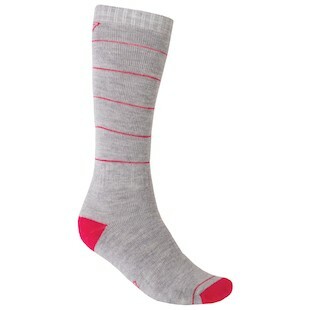 As Klim’s thickest, warmest technical sock designed specifically for women, this piece of gear not only insulates with a high thermal retention rate, but also works to wick sweat away from the foot so that it can breathe more efficiently. This is actually more important than the insulation itself! A wet foot becomes a cold foot very quickly, so getting the sweat away from your skin and out of the boot is essential. Moving up from the feet into the legs, the new Klim Alpine Pants are there to provide an outward defense against inhospitable elements. While they are notably non-insulated, the GORE-TEX three-layer laminate technology is guaranteed to keep you dry. This lack of insulation is done to give the rider options. For those who are more active on the bike, sometimes insulation is not a good idea, because it can increase sweat. However, if you are heading out into the bitter cold and want additional layers, these pants are ready to accommodate that, as well. Through it all, they remain true to their focus as a women’s pant as well. While many winter pants bulk up and lose their feminine cut, Klim has paid special to preventing that from happening here. Getting cold stinks. Getting cold and wet is even worse. For any of you who live in the northeast quadrant of this great country, you are probably still thawing from last winter and know the feeling well. 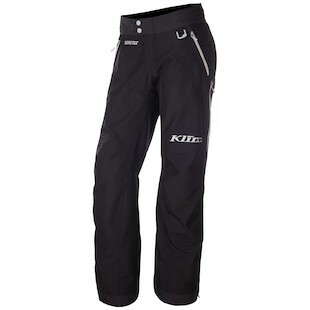 For the female rider looking to combat the cold, Klim has many options that offer great value and functionality.